I decided to ride Fernleigh Track this morning as I had nothing much planned for the day and at the last minute I decided to take the Bennett to give me the chance to see how it went on a longer ride. As it was a cold day, I got rugged up and even gave my long-unused skiing headband an airing. The things I was anticipating to cause me trouble were the saddle, mainly because of the seating position, and the gears, as I know that it can sometimes be difficult to change them and I wanted to make sure I could work my way through all the gears easily. As it turns out, I can use all the gears, though it is hard to move into the higher range with the front derailleur not wanting to shift easily. The rear derailleur works fine and I could get all gears without any trouble, though selecting the correct position first try will take a bit of practice with the friction shifter. I felt the lack of handgrips after the trip to Belmont, and on the way back my right hand felt a bit numb. My gloves are lightly padded which helped, but once I get grips this should not be a problem. I am still wondering if the moustache bars I originally intended for this bike would have been a better choice (I got these ones on it for only $10 and the moustaches cost about $50), and while I like the look of the ones I have on it, and I thought they would be fine, moustaches would have afforded a wider range of hand positions, as well as giving me more reach, although this is only an issue for longer rides. I can actually hold the bars on top of the brake levers and if I move the bell to the stem, French style, I will have more space to grip the bars closer to the centre. The saddle would be more comfortable if set further back but in its current position it is OK, though not perfect, and I have no saddle soreness after this 40km ride. I am tempted to try my Brooks saddle on it to see how it feels. An unexpected bonus was that I found I did the ride much quicker than I can do it on my Giant Cypress, taking about 20 minutes off the round trip. I weighed both bikes and they both weigh the same, around 16 kg, but they are built for different purposes and I could certainly feel the difference in the Bennett when doing the slight uphills on the Track: it was not quite as hard to get up them as it is on the Giant. 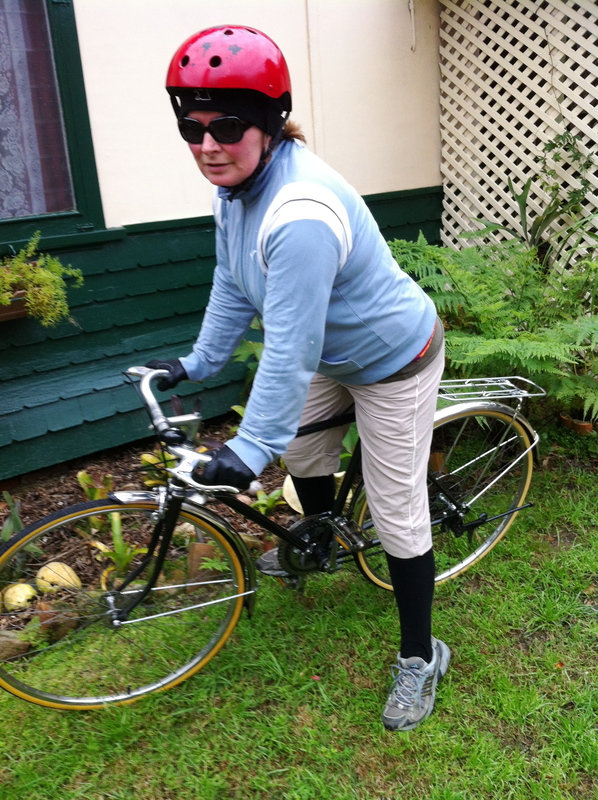 This entry was posted in Bennett, Bike tracks, Vintage bike, Vintage bikes and tagged Bennett, Fernleigh Track. Bookmark the permalink. If you’re keeping this bike Vicki, it would be worth putting your B17 on it and if you then like it, leave it there and try a sprung B66/B67 on the Speedwell. Perhaps you might try my loop frame with the B66 one day and see what you think, as they are so similar. That is excellent advice Peter, thanks for that. I had thought of one of the sprung saddles but I hadn’t thought of putting it on the Speedwell. Yes it would be great to try yours out, thanks! It was so warm and I was so cold, I loved it! Love the look of those bars (and the bike). Definitely deserves a B17, aesthetically as well as comfort-wise. 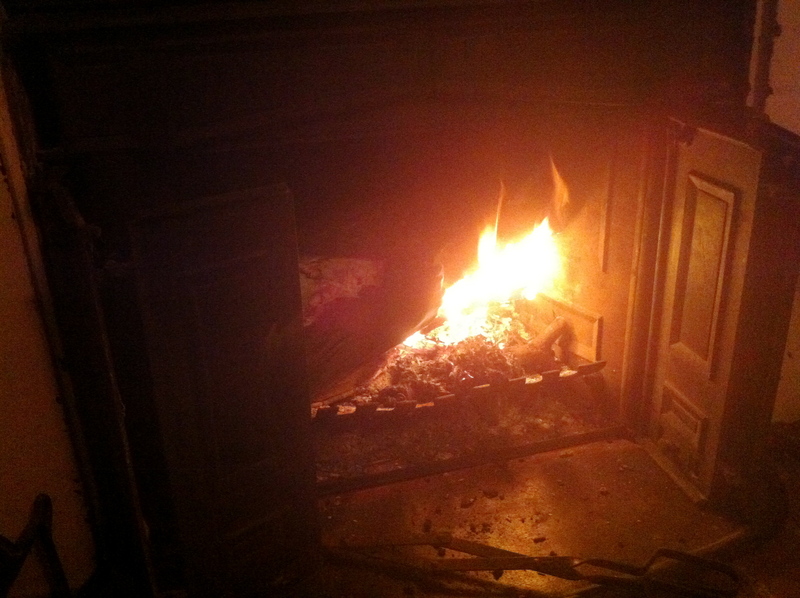 An open fire after a Winter ride, bliss! Thanks BB, I love the look of the handlebars too. I’ll be posting final pics when it’s finished.